← EIGHT DOLLARS BUYS A JAZZ WEEKEND! 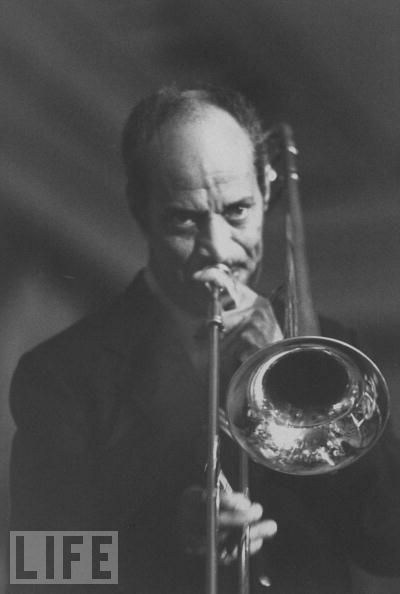 This entry was posted in "Thanks A Million", Irreplaceable, Jazz Titans, Pay Attention!, Swing You Cats!, The Real Thing, The Things We Love and tagged jazz, jazz blog, Jazz Lives, LIFE, LIFE magazine, Michael Steinman, sound, trombone, Vic Dickenson. Bookmark the permalink. Wow, what a picture! He’s one of my ‘bone heroes – thanks for the post, and all the wonderful videos in the other posts (I’m a trombone player, and there’s lots of inspiration in those videos). My favourite trombone player…by a New York City block. Thanks for the great picture of a special musician. Think I’ll just reach over and put “Gentleman of the Trombone” on now….cheers! My favorite Vic Dickenson solos are his muted solo in “When You and I Were Young, Maggie” where his trombone almost sounds like a human voice, and his Eb blues chorus in the CBS production from the late 50’s with Billie Holiday and an all-star band “Fine and Mellow” – great range, control, and use of trills, subtle growls and smears. He is perhaps at his best in that video recording. And many more! Do you know his solo on SOCIETY BLUES from the Sidney Bechet concert in Brussels (1958 — with Buck Clayton in the front line) and his solo on BOTTOM BLUES from the 1944 Albert Ammons Commodore date? Or with Louis on SUGAR in 1946? I could go on! Happy to meet a fellow Dickensonian!